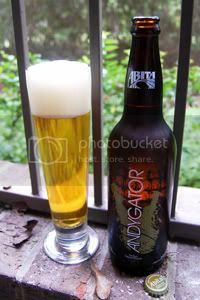 So far, the Abita brews reviewed here on PintLog have been from the Harvest series—mildish beers spotlighting a fresh Louisianan ingredient. While they've been pleasant enough, I decided to skip to something with a little more bite. Enter their Big Beer series, two eight percent beers with a more artisanal slant than the rest of their beers. Unlike other high-gravity brews, Andygator is fermented to a dry finish with a slightly sweet flavor and subtle fruit aroma. Just as a side note, it's worth noting that Andygator is presented in an absolutely gorgeous bottle—one of the nicest I've ever seen. Let's see if the contents are equally impressive. Appearance: A crystal-clear, golden body with a large and sudsy off-white head that burns out quickly and leaves little lace. Aroma: A rich and grainy malt body accompanied by a nice dose of earthy hops and some fruitiness. Somewhat Doppelbock-like, but clearly something different. Taste: Not much to report over what was represented in the nose; dry, earthy hops over a sweet cereal-like malt backbone with lots of dark fruit and nutty notes in the mix. The aftertaste is grainy with just a hint of booze. Mouthfeel: A smooth, medium body with good carbonation and a dry finish. Drinkability: Perfectly quaffable, just watch the eight percent alcohol content. Verdict: Basically a souped-up Helles, Andygator may not be a true Doppelbock, but it is a serviceable and solid enough brew. An interesting hybrid style, I'd like to see some other brewers have a shot at it.